The weekend started off well for Horsman, who worked hard in the free practice session ending the fifth fastest standard class rider with a time of 1:25.711. Q1 on Friday would see Horsman improve in time, and in position in hot conditions knocking off three tenths of a second posting a 1:25.421, meaning he would provisionally start in 20th place for Saturday’s first race, however Q2 on Saturday morning saw the teenager improve once again. Cameron posted a 1:23.856, leapfrogging him into 16th place on the grid improving vastly in time, meaning he would line up as the second fastest standard class rider. The afternoon’s first race saw Cameron get a great start and he ran with the leading group of riders in the standard class. He battled with Dan Jones until the end of the race for the lead, unfortunately just missing out on the final few laps, eventually crossing the line in second place. Race two on Sunday would see Cameron start from 14th on the grid by virtue of his lap time in the first race, only three places behind Dan Jones who started from pole in the standard class. From the lights Cameron got a great start, however after just a handful of laps he pulled into the pits with a brake issue. The team worked hard while the race was ongoing and freed the front brake off enough to allow Cameron to finish the race in eleventh place, picking up five Championship points. 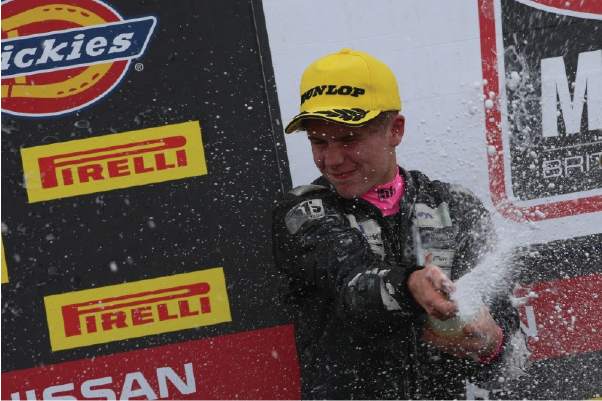 Cameron now stays in fifth place of the standard class standings on 115 points, with the next round of the Championship in two weeks time at his home track of Brands Hatch. The weekend in the Czech Republic at the North Bohemian Autodrome Most hosted over two hundred riders from thirteen European countries competing for points in the Alpe Adria Championship. For Cameron the weekend did not start well as the luggage containing his racing kit did not arrive at Prague airport and is still missing resulting in Thursday being spent shopping in Prague for replacement kit. From the start Cameron was determined for success with excellent times being posted for the third free practice and the Official Practice on Friday. Saturday qualifying saw Cameron in pole position on the grid and from the start of Race 1 he was out in front racing hard, taking the chequered flag some 33 seconds over the second placed rider and also posting the fastest lap time. 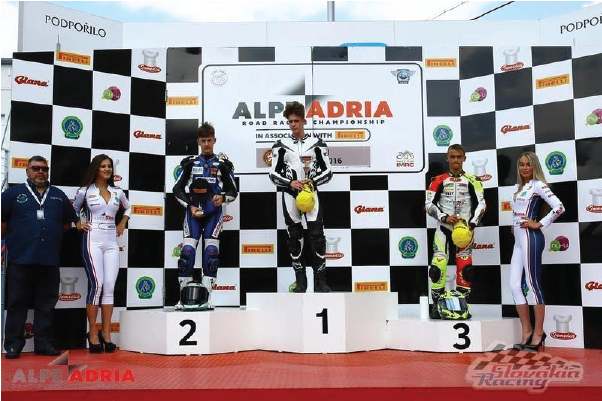 Race 2 on Sunday, Cameron was on pole and fought a hard fast race with Martin Gbelec from the Czech Republic to be beaten into second place by only 0.039 seconds, but once again achieving the fastest lap time. Cameron now moves up to second place in the Championship behind Oliver Konig. Commenting Cameron said, this has been an amazing weekend in Czech Republic, I love racing the EE125; I am so grateful to Roberto for all his work, help and advice and to my Dad and family for all their support. The final round of the championship is at Slovakia Ring 23 – 25 September. 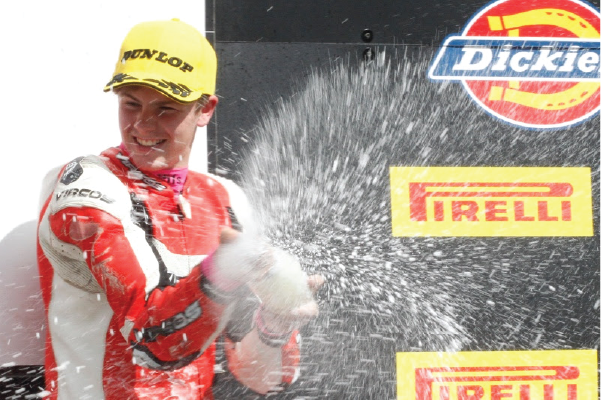 Lewisham teenager Cameron Horsman kept up the pace in the Hel Performance Standard Moto3 Championship battle this weekend at Snetterton, achieving two solid podiums in both races. Horsman started the weekend brightly, ending the free practice session fourth fastest standard man, only three tenths of a second behind third place man Liam Delves. First qualifying would Horsman improve in time following changes to his machine to give a better feel onboard the bike around the fast and flowing 2.9 mile Snetterton circuit. Cameron ended Q1 only 1.7 seconds behind the fastest standard rider Storm Stacey, posting a 2:05.840. Saturday morning’s second qualifying wouldn’t help Horsman at all, after heavy rain forced the session to be run in wet conditions, forcing Horsman to gain valuable feedback with a wet setup. This meant that Cameron would stay in 16th for the afternoon’s sprint race, following his time set in the dry first qualifying. From the lights Cameron got a great leap on a dry track and started to battle within a pack of riders for 14th place, and also the lead in the standard race. Cameron diced for position all race long, but would have to settle for 16 points after losing out in the battle for second place with Storm Stacey after Dan Jones pulled away to the standard class victory. Sunday saw Horsman once again make a great start from 16th on the grid, as he looked to battle for the lead of the standard class race. Horsman was then stuck in traffic and the leaders of the Honda NSF250 race pulled a considerable gap on the Lewisham boy. He rode a very lonely race, eventually crossing the line in 16th place, and the third standard man home, earning another important 16 points to his Championship campaign. After the race Horsman said: “I’m very pleased to walk away with two third places this weekend. Snetterton is a tough circuit because it is so big and wide, but I rode hard and made sure I brought home the points, after walking away with none from the last round. It’s good for the Championship but I have a lot of work to do now, but I’m looking forward to the challenge at Thruxton next time out. Cameron now moves onto 90 points in the Championship standings, sitting in fifth place just behind Mark Clayton. The Championship now moves onto Thruxton in Hampshire for round six of the series in two weeks time.